Last week I gave a presentation at an energy efficiency seminar in Kiev. I left the office in Brussels a bit after five and caught the new train from the European quarter to the airport. Three women on the platform discussed national electoral systems. On the platform there was an advert to join the police force, showing a man with a gun. It was the first time I’d been to the airport since the terror attacks in March. A ten minute walk, with plenty of stairs, to get to the airport proper, and the baggage check was serious; but I still had time to get something to eat before my plane left at eight. Austrian airlines’ colour is tomato-soup red. Fine, light evening in the sky. Pünkltiche landing in Vienna, Fünfzehn Grad. Umlauts seem less easy to make out, to hear, in Austrian German. When we arrived just before ten, Vienna airport was closing up. I raced through to level G, where passport-controlled flights go from. People were sleeping on the seating; the queue for my flight was unusually polite. As I went down the walkway to the plane a jolly Ukrainian man in a blue striped shirt handed me my passport, which I’d dropped. His daughter is studying in Amsterdam (and getting distracted by the city, maybe she should go to Canada). It is too expensive to study in the UK. We drove steadily at 100. By the roadside I saw a taxi; medium-sized wild dogs; and many signs: Global Top Company Daewoo, Порще [Porsche], Готель [hotel], Баня, Vodka Grill. Tower blocks; bridge over the Dnepr. Chillout café. Church, illuminated. My hotel at last; a beer from the minibar. In the morning the city appeared in the window. I walked to the hotel where the seminar was being held. It was a pleasure to walk in the fresh city. A grey dog passed me and went down a side street. I went back to photograph it, it was gone. and a block of flats. How many Ukrainians read the latin alphabet, I wondered. Most? Easily, or haltingly? At the seminar speakers from Ukraine, Croatia, Austria, Italy and the UK described their work to promote energy efficiency. In my presentation I argued that energy efficiency is not easy or glamorous but it makes a difference. Leaving, I caught a taxi in the rain. and several groups of big buildings just like this. We hit a traffic jam when we got on the motorway. What’s that building over there?, I asked the taxi driver. It makes hot water for district heating, he replied, adding many interesting remarks on energy in Ukraine (see https://paulhhodson.wordpress.com/2016/05/19/on-energyawareness-in-ukraine-based-on-a-small-sample/). As I got out at the airport, he said the time to come to Kiev is late May – after the rain. It’s the 19th today, I said. Yes, he said. This is mid May. There were as many soldiers in uniform in public places as we now see in Brussels. But they were younger, and not obviously armed. I flew back with LOT. Please fasten your seatbelt, very dynamic tops of clouds today, said the pilot. As we came down towards Warsaw flat-bottomed clouds sat like islands in the air. At Warsaw airport I found a sunlit sushi restaurant with Japanese beers on display. I asked which is the best? This one, said the waitress, patting the Zywiec on tap. I can get that in Brussels, I told her, and asked for a Kirin. Changing trains on Saturday (Paris-Nice, Nice-Genoa), we had time for lunch in Nice. As well as a route number (the one in the picture is a no. 17) each Nice bus has an individual identification number. I sat and watched and no. 163 came past; abandoned my tuna and chips and ran quite a way after it; but was never going to catch it. So I have to ask you take this number on trust. Leaving an (excellent) workshop in Kiev on the EU Energy Efficiency Directive, I caught a taxi to the airport in the rain. We hit a traffic jam when we got on the motorway, just before the Dnepr. I rolled down the window to take a picture. What’s that building over there?, I asked the taxi driver. It makes hot water for district heating, he replied. Big, I said. Not really, he said, we have some twice as big, with four tubes. They are from Soviet times and many use coal or a form of oil. We produce high quality coal but we export it and import poor coal from South Africa. Perhaps we should invest in the system, but then I think my bills would go up. The cost of gas for heating, for people who have individual heating, has gone up five times. The government then offers them 40% subsidies towards the cost of other heating systems, such as wood. My own bill [for collective heating] has doubled – although in dollars it is the same as it was. What about energy efficiency? I asked. It has become a trend recently, he replied, it has become fashionable – thinking I meant renewable energy. Gas stations have started putting panels on their roof and using this to advertise on facebook, saying we are a modern company. (He went on to describe solar thermal, using verbs because he did not have a noun for it.) I rented a summer house near Nicolaevsk (?) last summer, he went on, they are not on the gas network. The owner told me that when everybody came back from the beach the electricity network used to crash. Now he and others in the village have this system, this no longer happens. The system provides all the hot water for the holiday house. The owner can charge more because the people staying there have hot water always on tap, and in addition he doesn’t have to pay to heat their water. The system cost him half a summer’s rent – it cost a lot, 8 or 9 grand dollars, because it is a remote area – but it will pay for itself in three or four years. I said we have solar thermal at home. He asked about the capital cost and the payback period. I said it was supposed to pay back in five years but with poor reliability it will be more like eight. I wonder if all taxi drivers, all Ukrainians, are as well informed about energy. Noonday (2015), Elinor’s diary for October 1940: Another bright, sunny, gritty day, no wind. Water on the marshes steel blue, reflecting light back at the sky, the reeds a vicious yellow-green, the sort of colour you feel can’t possibly occur in nature, but there it is, you’re looking at it. 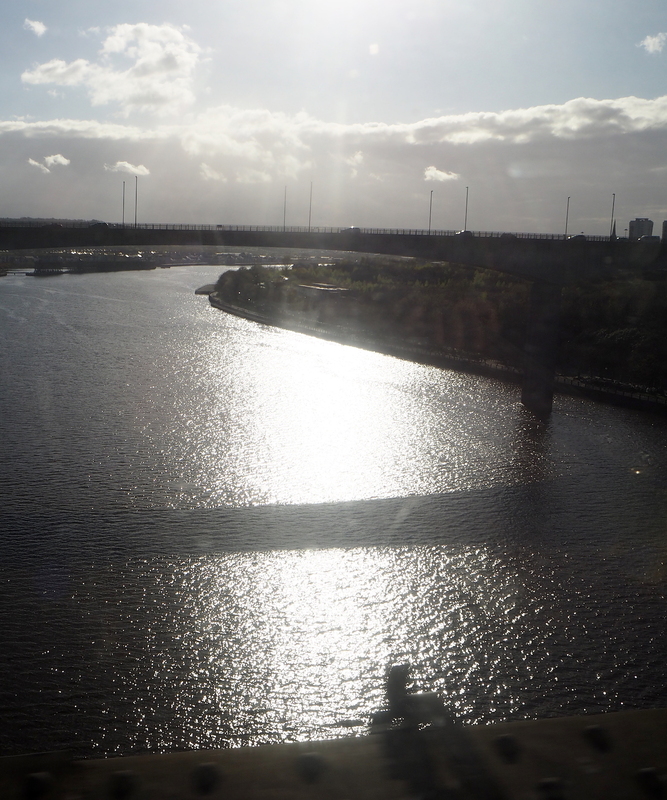 and the steely river Tyne as the train crosses into Newcastle. “Noonday” is the last of Barker’s Life Class trilogy. I am disappointed – because I have read too much about the second world war (its setting) and not enough about the first war (the setting of the other two)? Or because every character in London gets caught, once or more, in a building that is being bombed, and this seems like too much coincidence? Another quote I liked from the book: As you get older, you think you’re moving further away from your parents, leaving them behind, but it’s not like that. There’s a trick, a flaw, some kind of hidden circularity in the path, because suddenly in old age, there they are in front of you again, and getting closer by the day. I think that happens already when you first become a parent yourself. I don’t know what the point of mirrors is. They tell you what you already know. 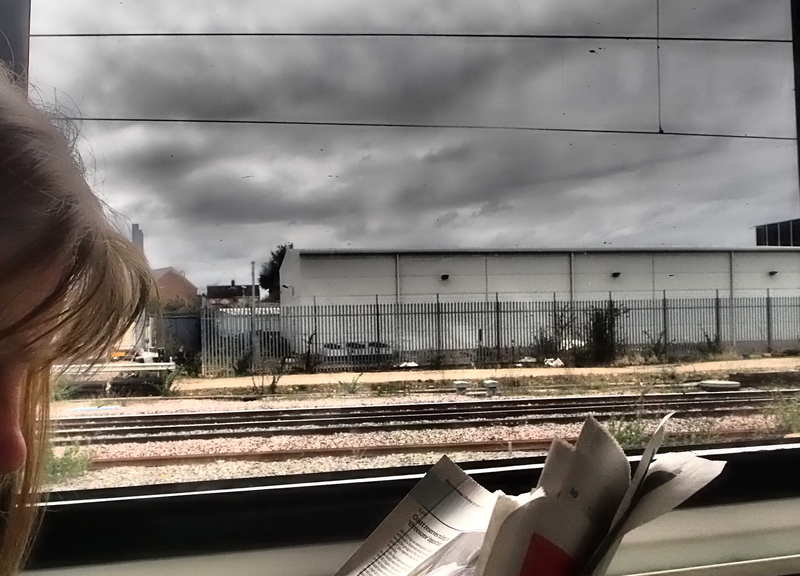 On Saturday I visited South Woodford and Stoke Newington, neither of them places I know. William Morris lived in Woodford for 40 years – this is his tomb or memorial. Mary Wollstonecroft opened a girls’ school on this site at Newington Green. I ate some great chips outside South Woodford station and visited an Arsenal-supporting pub in Stoke Newington. Stoke Newington has many cyclists and expensive housing. I liked this example of bike storage.